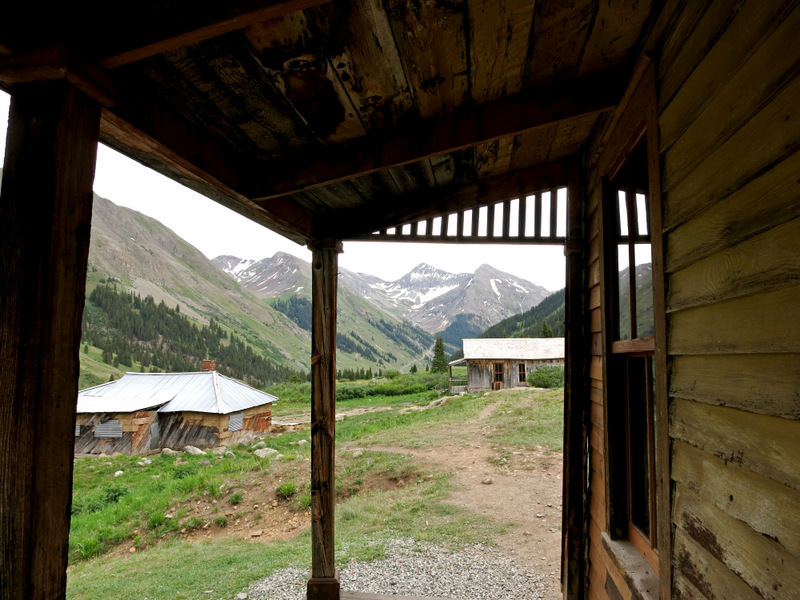 Silverton is the ultimate Colorado mining town. 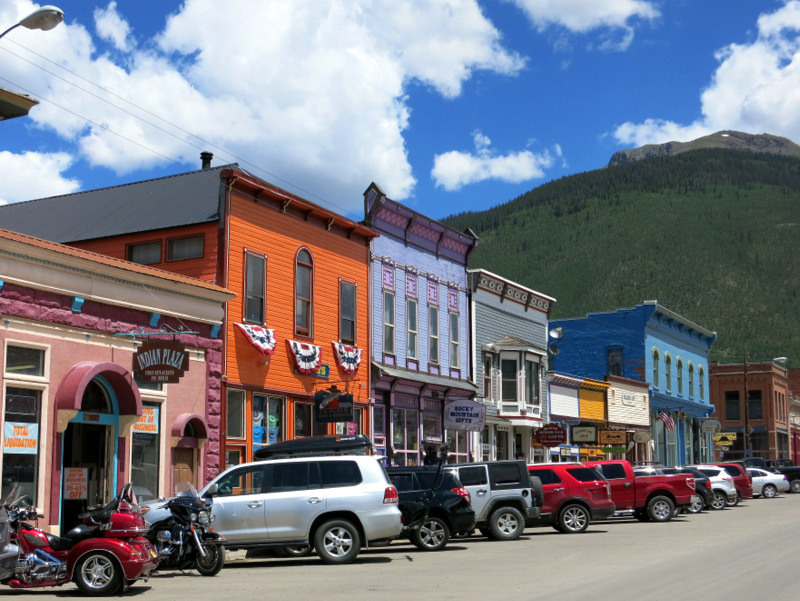 There’s a whimsical main street lined with colorful Victorian buildings, lofty snow capped peaks in every direction, a historic steam train that rumbles into town several times a day, and slews of old crumbling mines perched on hillsides. Basically it’s a whole bunch of Colorado charm mixed with a rich mining history all rolled up into one delightful little town. Last year we stopped in Silverton for a quick stroll around town on the way from Durango to Ouray. It seemed like our kind of place, so this year we came for the entire week. Silverton is truly a mountain town. Tucked down in a narrow valley surrounded by soaring 13,000 foot peaks you can’t get much more in the mountains than this. All the roads in and out of town cross over crazy high mountain passes. Like 10-12,000 foot high passes. 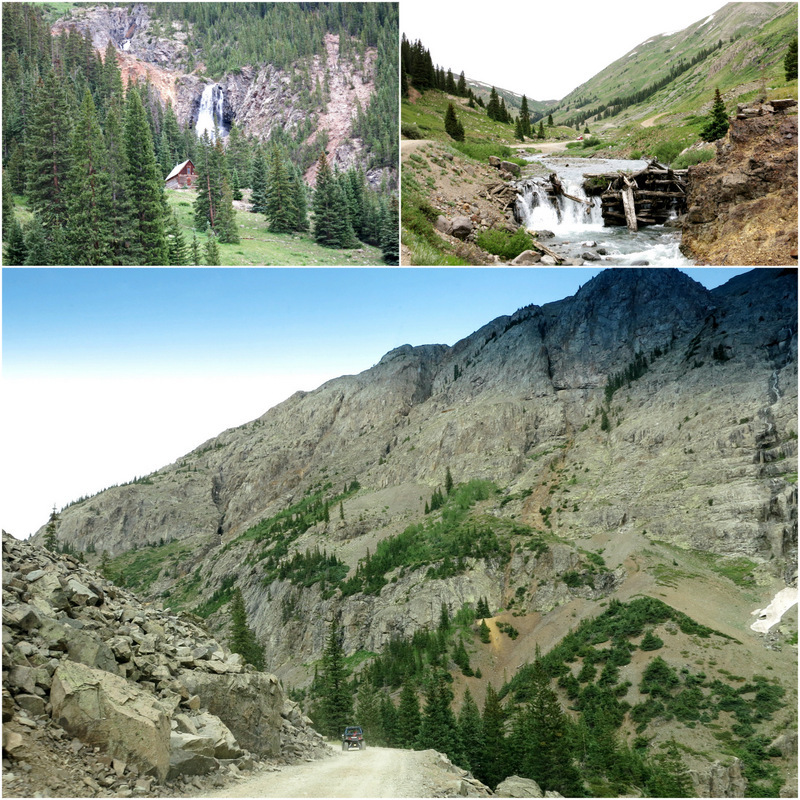 From Durango to Silverton there is only one route – the famed highway 550 – better known as the Million Dollar Highway. We drove this route last year so we already knew all about the steep grades, sharp curves, and lack of guardrails. Honestly it sounds scarier than it is. I mean, there are two 10,000′ + passes to cross, and a bunch of twisty turny sections, but who cares about all of that when you have a view like this. After nearly 50 miles of mountain wonderland the road descended into Silverton, curling into a giant S curve with a view of the town below. I remembered just in time that the trees thin out for a brief window allowing a clear shot of the town below, and had my camera ready and the window rolled down. 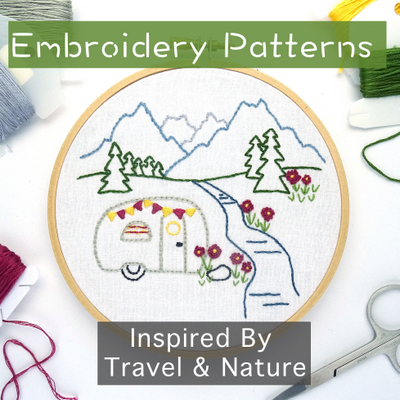 RV travel doesn’t allow for many spontaneous pull overs, which means lots of out-the-window, drive by photos. I would say they have about a 10% success rate. There is a small pull-off at the overlook, but it’s way too small for a truck-Airstream combo. 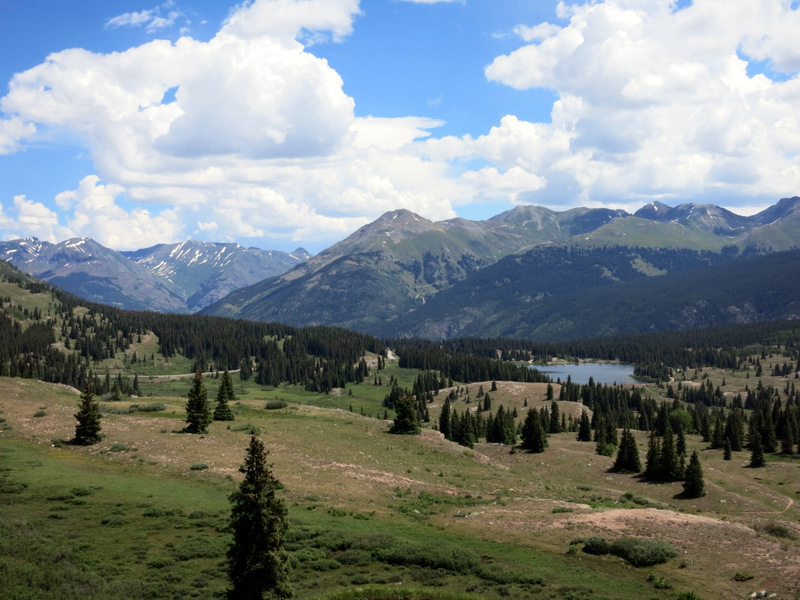 By the way, those two mountains beyond town are Storm Peak (13,402′) on the left, and Tower Mountain (13,558′) on the right. If they don’t look that tall it’s because the town sits at an elevation of 9,318 feet. I told you it was a mountain town. The first order of business upon arrival was finding a place to stay. 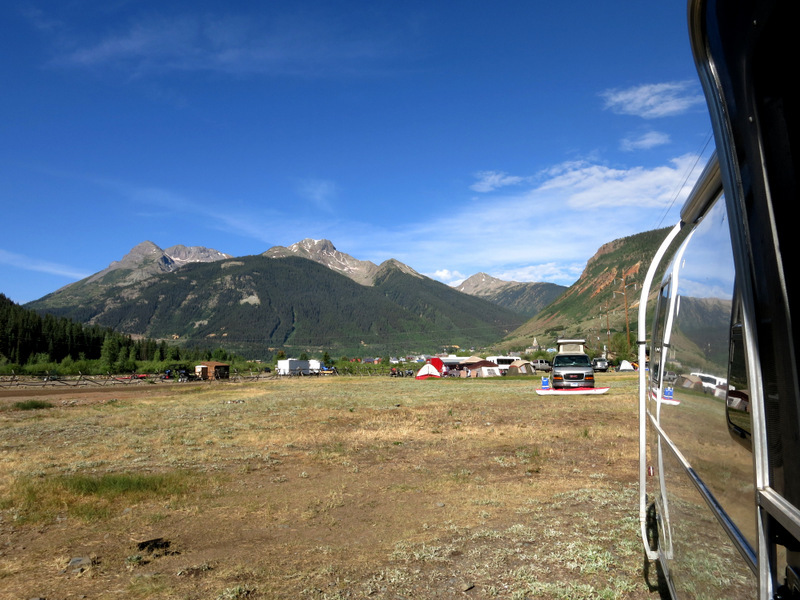 There are a number of boondocking spots around Silverton, as well as a national forest campground a few miles west of town, but as usual the issue was going to be finding a spot with a usable cell signal. We knew there was good coverage in town, but didn’t expect to find much outside of town because…well you know…mountains. The most promising area was Forest Road 585 a few miles west of town. About 4 miles down this road is the South Mineral Creek NF Campground, and closer to the main road are two designated boondocking areas. This is well-known, popular area, but we foolishly thought that since it was Sunday afternoon the majority of weekend campers would have left already. We thought wrong. We pulled in and were greeted by 30+ RVs crowded into a circular shaped area with trees on one side and a river on the other. No one looked like they were going anywhere. It only took one glance for me to know I didn’t want to stay there. That many RVs so close together in a non-campground setting with no rules about quiet hours is the perfect recipe for loud all night partying. Besides, what’s the point of boondocking if you have strangers on either side of you less than 6 feet away? I kept my mouth shut though, because I am always the hasty one who rejects potential camping spots based on first impressions. Instead I went out and a took a picture of the scene while Tim checked the cell signal strength. Luckily we tend to agree on these kinds of things, and the first thing he said when I returned was “I don’t want to stay here.” Phewww…me either. Even if it hadn’t been so crowded the signal wasn’t strong enough anyway. On to plan B. 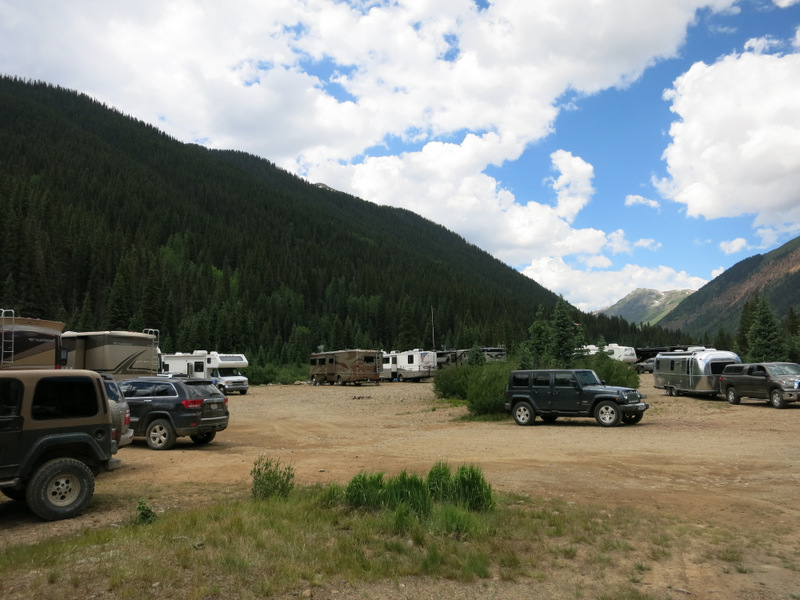 A small portion of the RVs crowded into this boondocking area- not our scene. Plan B was a private park in town. There are four to choose from. We drove past two on the way to our first choice, the Silverton Lakes Campground, and they both looked full. Not a good sign. Sure enough when we showed up at Silverton Lakes they only had one available site for the week. And of course it was the least desirable site in the park. Located right behind the office with no view, a 50amp electric connection (we only need 30amp), and the sewer on the wrong side making it useless for us. For the pleasure of this site we would have to pay $39/night. Ahhh… the joys of full-time RVing during vacation season. After some back and forth we decided to take a spot in the tent section for $25/night (still pretty steep for dry camping). Except when we walked over to the tent area to take a closer look it was crammed full of tents and OHVs. We had already paid with the assumption that they had space for us. We spotted some RVs in the field next to the tents, on the other side of the fence. Tim went back to the office to ask if we could park there. The women at the front desk (who told us that she was just filling in and didn’t usually check people in) had no idea what he was talking about when he asked about the fence. So we asked the other campers in the field and they said it was the overflow area for the RV park. Works for us. Even better, the two other RVs were in the process of leaving and we soon had the field all to ourselves. Well, almost to ourselves. Not long after settling in we got some van dwelling neighbors. Not just any van dwelling neighbors though. This particular van is the part-time home of fellow travelers Susan and Brian. Susan emailed us a few weeks ago introducing themselves and wondering if maybe we would cross paths in CO. Well it turns out that we did! Our view to the west + friends! One of the things I love about meeting people on the road is how everyone has a unique story is. It’s inspiring to hear about the different ways people make travel work for them. When we first went on the road I assumed the majority of people we met would be retired folks and families on vacation. To a certain extent this assumption has remained true, there are a lot of retirees and families on vacation traveling around in RVs. But there are also single folks, couples who work from the road, travelers who move from place to place working different jobs, part-time travelers with aspirations for more, full-time families, and so many more. Brian and Susan are perfect example of this phenomenon of non-traditional travelers. Their story in a nutshell is this: Brian lives full-time in his van and over the years has traveled all around the U.S. He teaches college English classes and currently has a position in Phoenix, which means that during the school year he stays in various campgrounds in the area. Susan has a job that keeps her in Dallas most of the time, but she joins Brain in the van when she has vacation. During those times she flies to where Brain is currently located and they travel around together. This time they are on a two week tour through CO. Our visit with them was short as they were only passing through the area, but we had a nice happy hour with lots of snacks and discussions about where we’ve all been and where we hope to go in the future. So happy we got to meet them both and hopefully we’ll cross paths again someday. 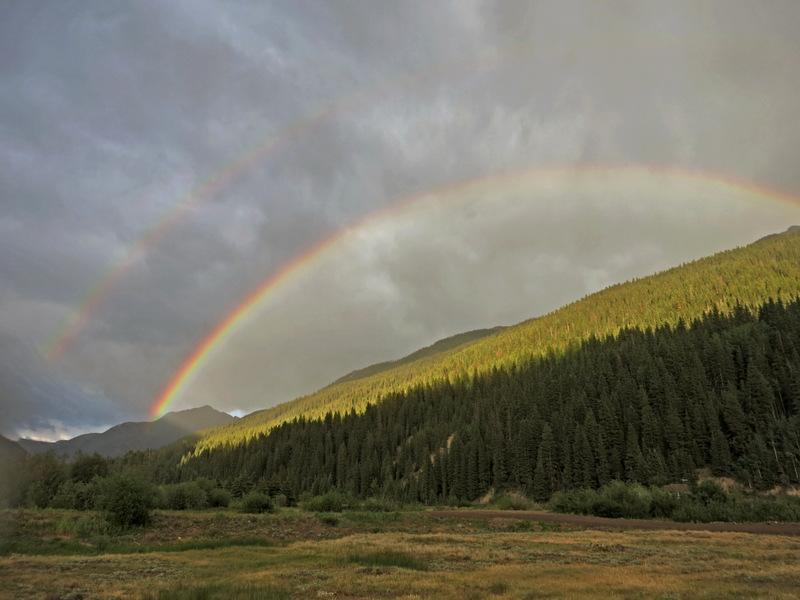 Our week here in the Silverton has been dominated by rain, rain, and more rain. The weather in Colorado this time of year is pretty unstable. It’s been especially unstable this week. A typical day begins with bright blue skies and lots of sunshine. Around noon puffy clouds start appearing over the mountains. By early-mid afternoon the rain rolls in, sometimes accompanied by thunder and lightening. If we’re lucky the rain stops around dinner time, and by sunset the sky has cleared up again. This is a really terrible pattern for us. Tim works roughly from 8-4 so going out and doing stuff in the morning is not an option. So far we’ve only been able to have an after work adventure one day this week. Hopefully we get at least one one more chance to explore before the end of the week. 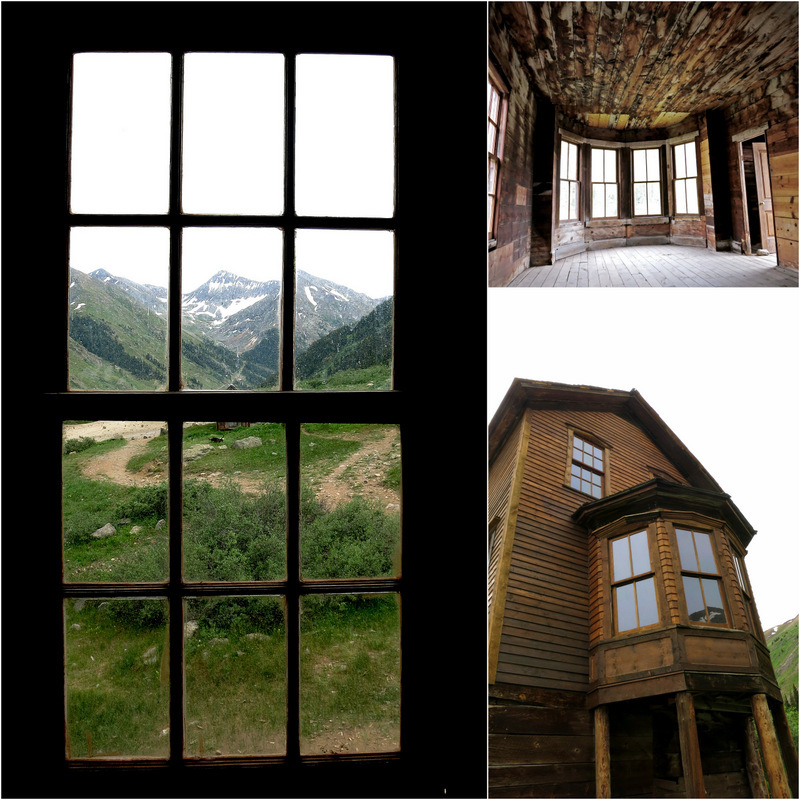 On the one day we did get out, we took an amazing drive on a portion of the Alpine Loop to see some old mines and a ghost town. 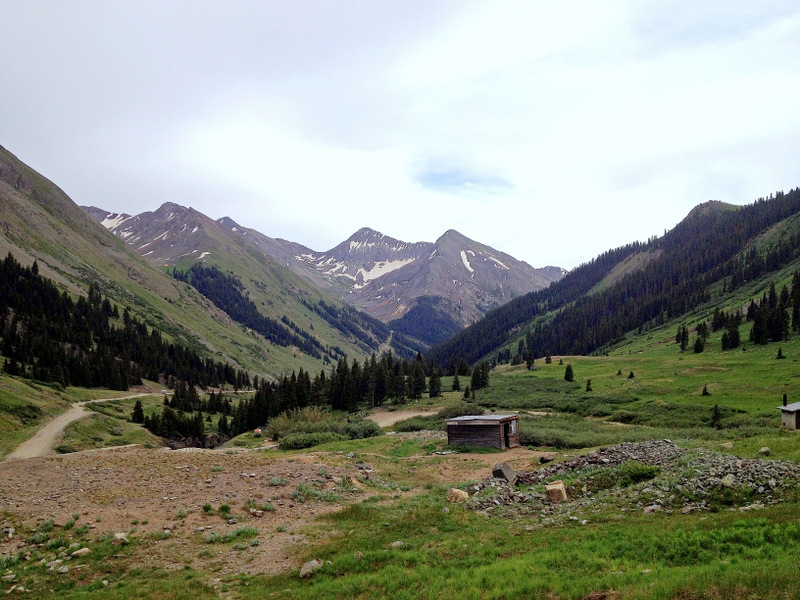 The Alpine Loop travels for 63 miles over some rugged and impressive terrain between Silverton, Lake City and Ouray. The majority of the loop is recommended for 4WD high clearance vehicles only. In addition to some narrow sections and sharp switchbacks, it also crosses over two 12,000′ passes. 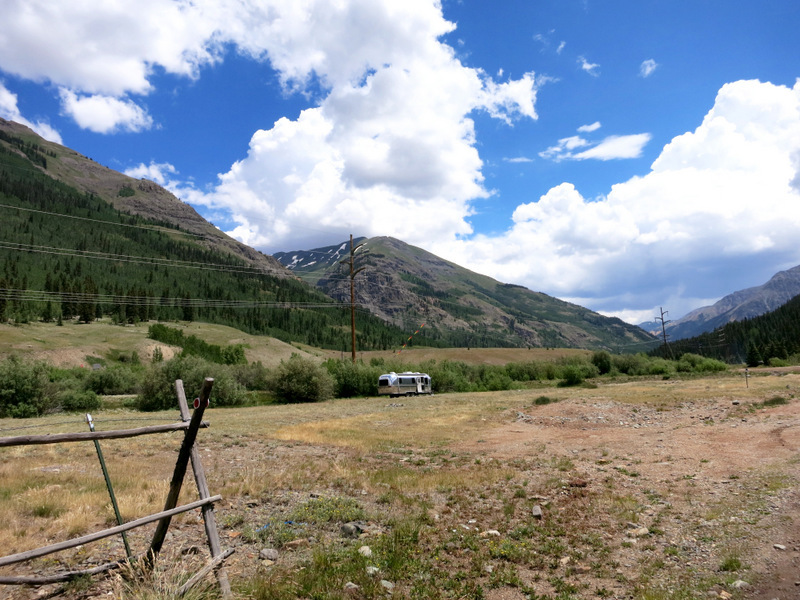 The section we drove – about 26 miles round trip – was easily drivable with our truck. There were a few bumpy sections, but nothing so extreme that a normal SUV couldn’t handle it, and no 4WD needed. I am not sure how the rest of the road is, but I did come across an account of some folks who drove the entire loop in a truck camper, so it can’t be that bad. 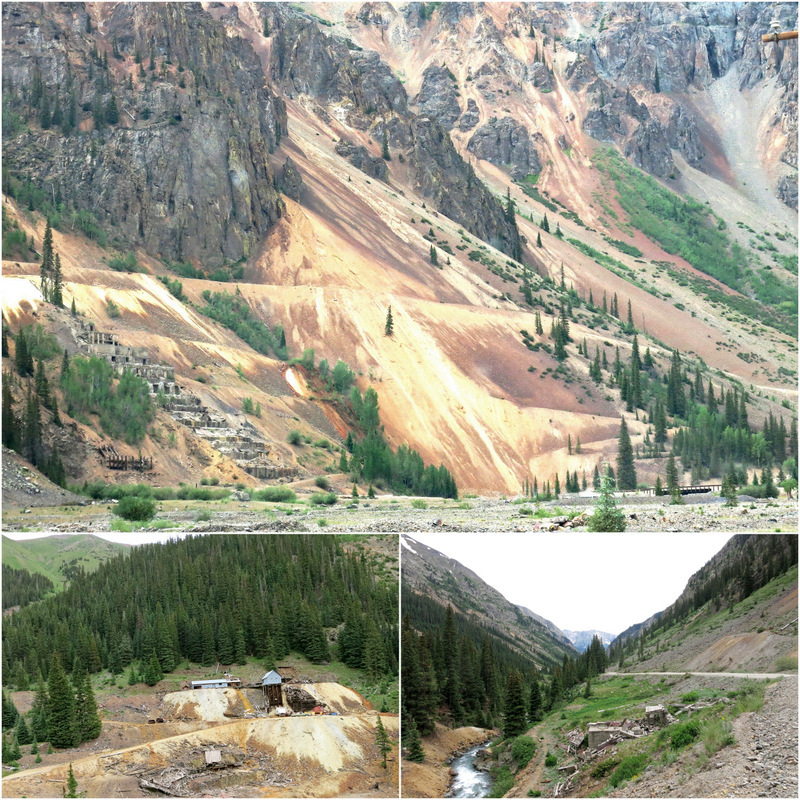 The Alpine Loop not only offers up spectacular views of mountain scenery, but also gives travelers a glimpse into the rich mining history of the area. I don’t know how many old mines and mills are on this loop, but judging from the amount we saw in the short section we drove, it’s a lot. The first we came upon was the Mayflower Mill. This large mill is right on the edge of town and has a long history. From 1929 to 1991 it operated as an extraction mill for gold, silver, copper, lead and zinc. When it finally closed it was the second oldest operating gold mill in the U.S. Today the mill is open for tours, but when we drove past it had already closed for the day. Up next was Eureka where we spotted the remains of the Sunnyside Ore Mill perched on the side of red mineral streaked hillside. Eureka is also the site of the Eureka Campground. This rustic camping area alongside the Animas river has dry sites for $10/night, and electric hook-ups for $25/night. It looked like a nice spot with sites tucked in the trees along the river. After Eureka we passed more remains of mines, mills and old mining camps. Our final destination was Animas Forks. 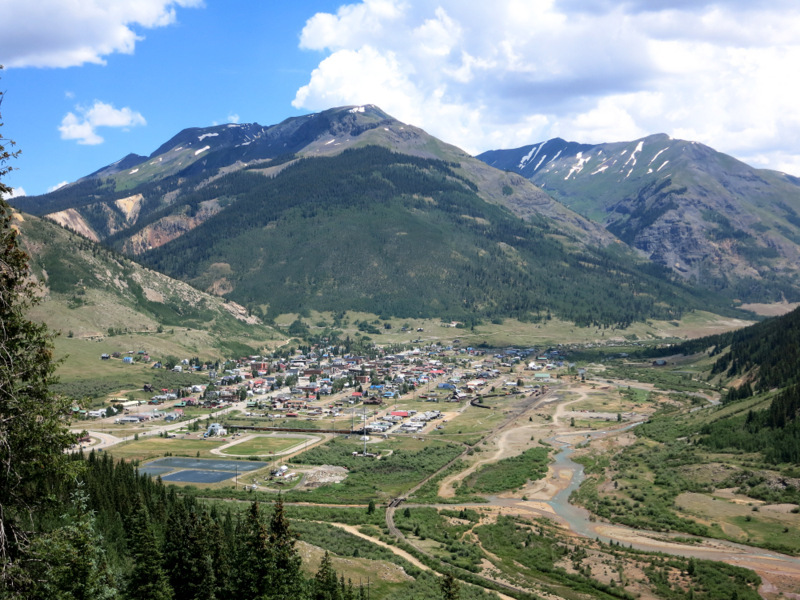 At 11,200 feet in elevation this former mining town once had 450 residents, and the local newspaper, The Animas Forks Pioneer, boasted the highest elevation newspaper printing press in the U.S. The town was first established in 1873 and grew rapidly over the next ten years as prospectors flocked to the area to mine silver and copper. The boom didn’t last long as the profits began to decline and the frequent occurrence of avalanches hindered development. The town enjoyed a brief resurgence in 1904 with the arrival of the Gold Prince Mine. The Silverton Northern Railroad was extended to Animas Forks, raising expectations for the town, but the mill closed in 1910 and was dismantled in 1917. Today the ghost town is managed by the county and BLM. In recent years they have stabilized and partially restored many of the buildings which are free and open for the public to explore. While the mountain views from town are lovely, life was anything but easy up here in the high mountains. 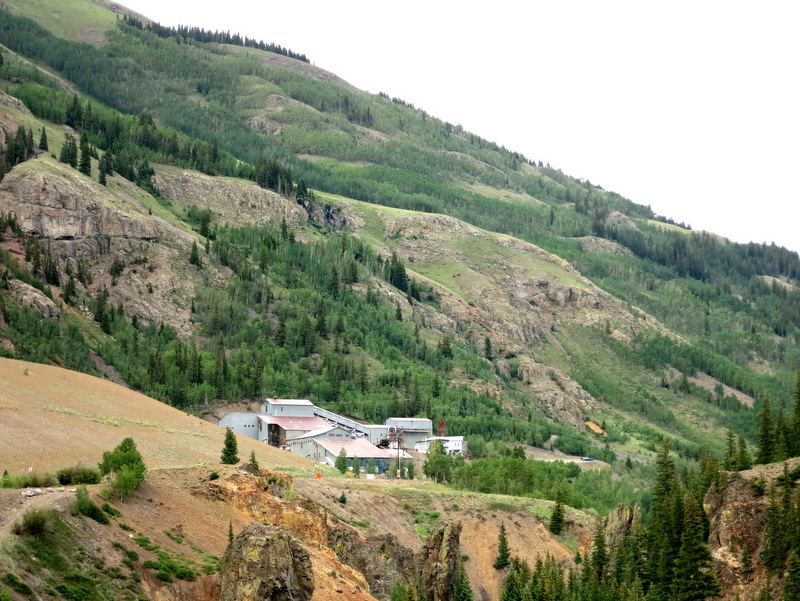 Most of the miners would retreat to Silverton in the fall and return in the spring. The ones who remained had to tough it out with dwindling supplies, epic storms, and frequent avalanches. The Duncan House, or Bay Window House, was built in 1879 by minor and mail carrier William Duncan. This house is not only remarkably preserved, but also has the most incredible views from it’s numerous windows. 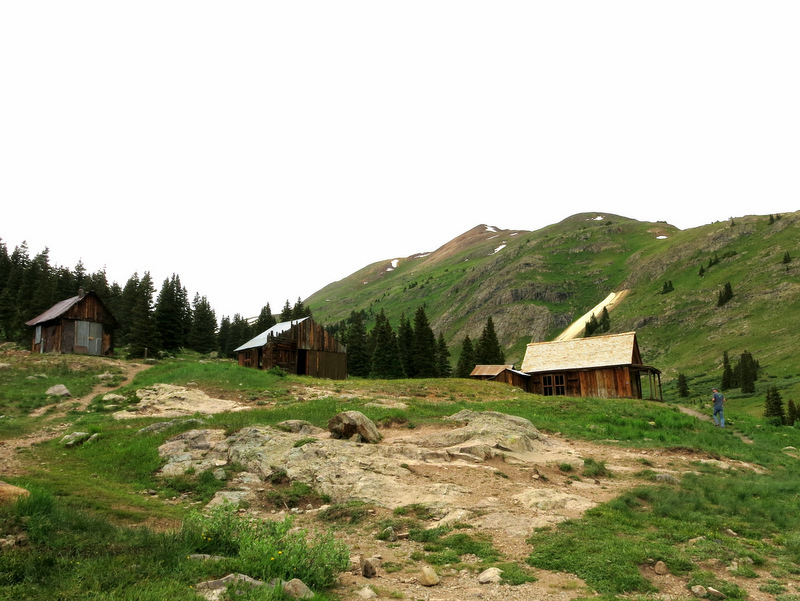 Not much is left of the mines and mills at Animas Forks. Below are the remains of the boarding house, and beyond the Columbus Mine and Mill. All that’s left of the Gold Prince Mine is the foundation. One of the buildings still standing is the jail that was built in 1882. Prettiest setting for a jail ever. Let’s hope the weather cooperates over the next few days so we can get out for some more exploring! 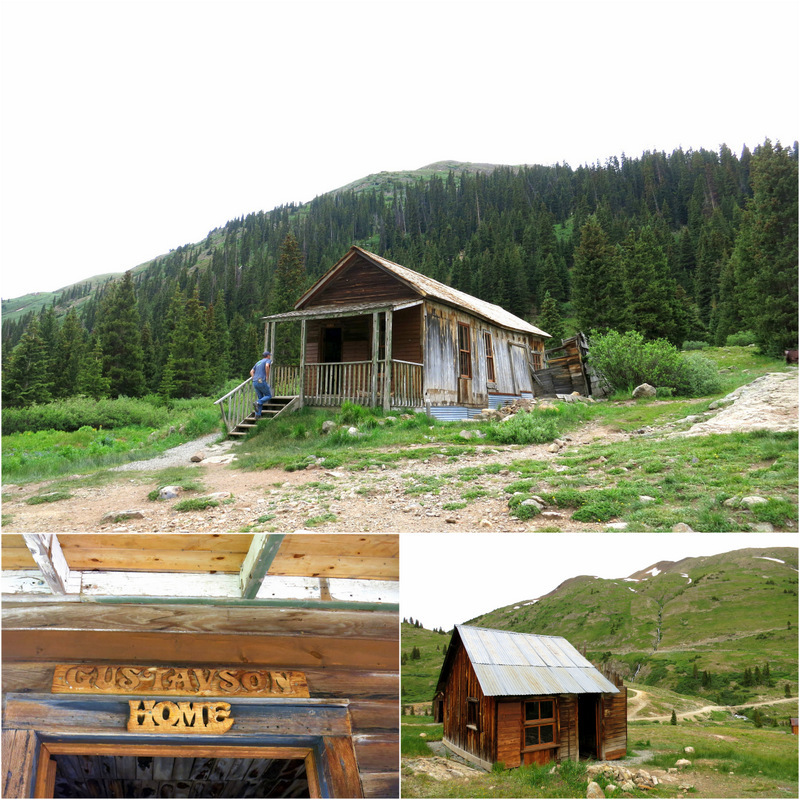 We watched Silverton grow over the years, and I saw significant change when I visited in 2010. I love the area. I arrived in Durango via Chama NM, then took the ride up. Thanks for sharing the great pictures and memories. Silverton is definitely a busy little town. I can imagine that it has changed a lot over the years. We’re happy that we decided to spend a whole week here! You found some great ghost towns! Looks like you’re going to hit wildflower bonanza in the next few weeks! We’ve been amazed by the number of ghost towns and old mines. This was once a very busy area! The wildflowers are just starting around here. I expect we’ll see tons more in next few weeks. 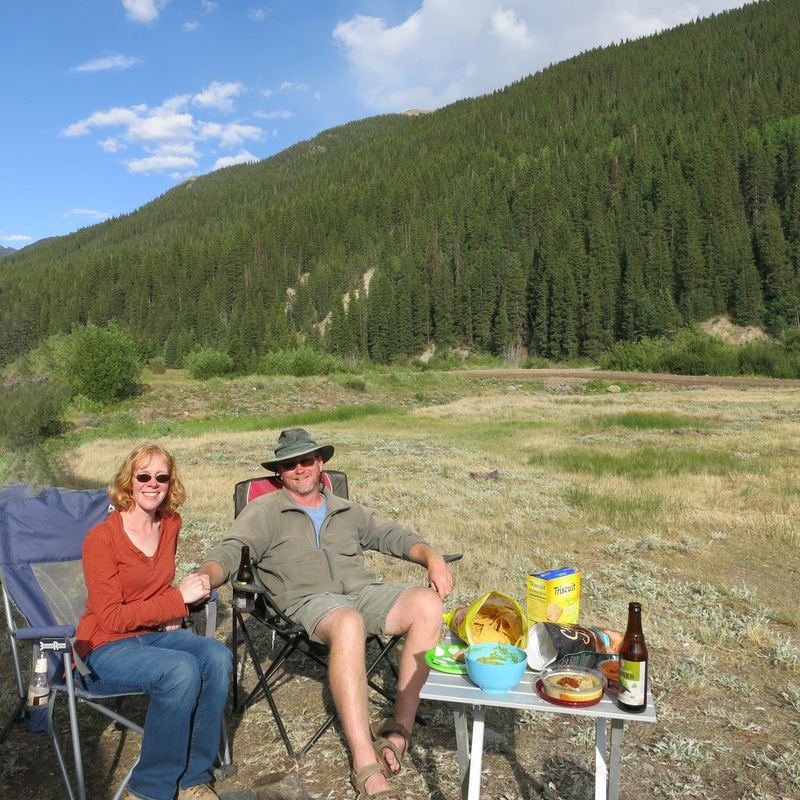 We rented a Jeep and tent camped all around Silverton about 15 years ago and had a blast. I do remember those passes well, without guardrails and having to back up when someone came from the other direction…yikes! What a great tour of the area! It has been many, many years since I’ve visited (pre-trailer) and I clearly recall the hair-raising drive on the Million Dollar highway — so it makes me feel better that you said it wasn’t bad (or perhaps you’re just a lot braver than I am…). 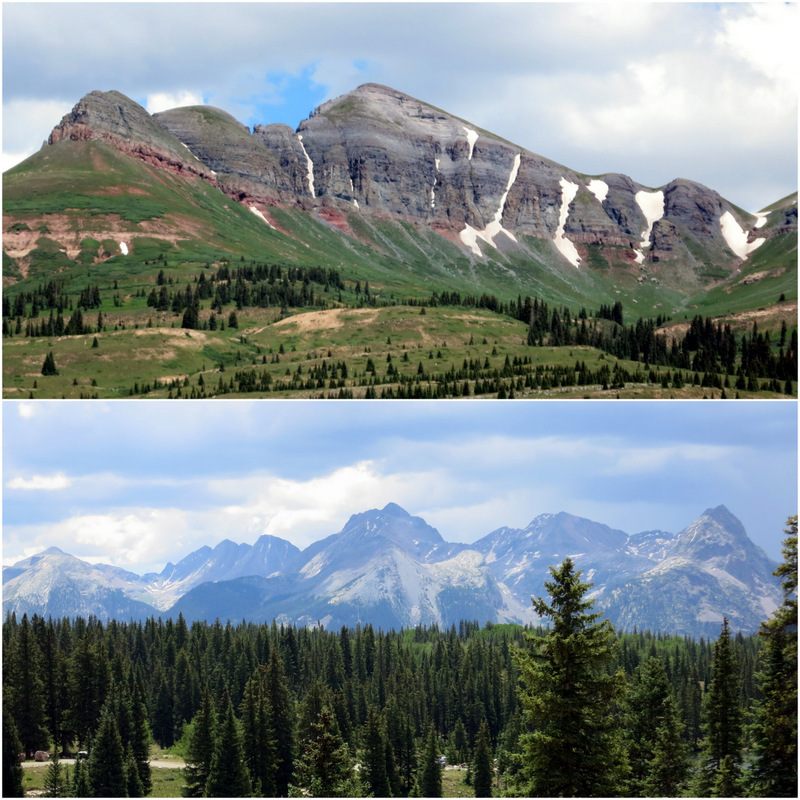 We love the Durango-Silverton area. 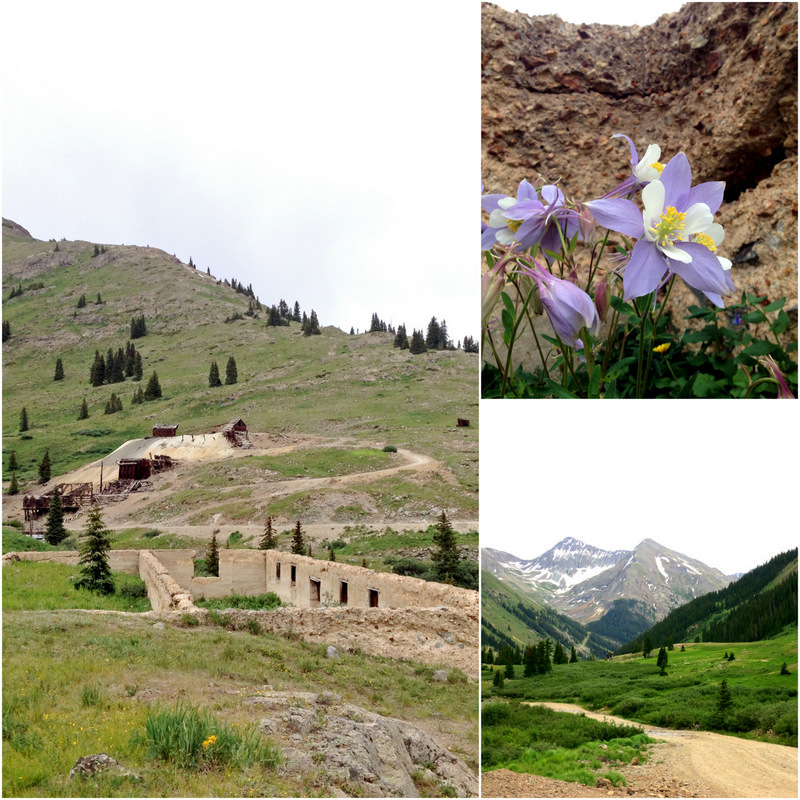 We went on a great hike last year up to the top of Kendall Mountain from Silverton! Have fun as you head north. The wildflowers around Altmont and Crested Butte were AMAZING last week. old…. My husband asked Caleb, how did you get down that tall mountain? Caleb replied, I crawled down the mountain backwards…this is a beautiful mountain…I went in the old mine at the base of the mountain…. If only, walls could talk…. 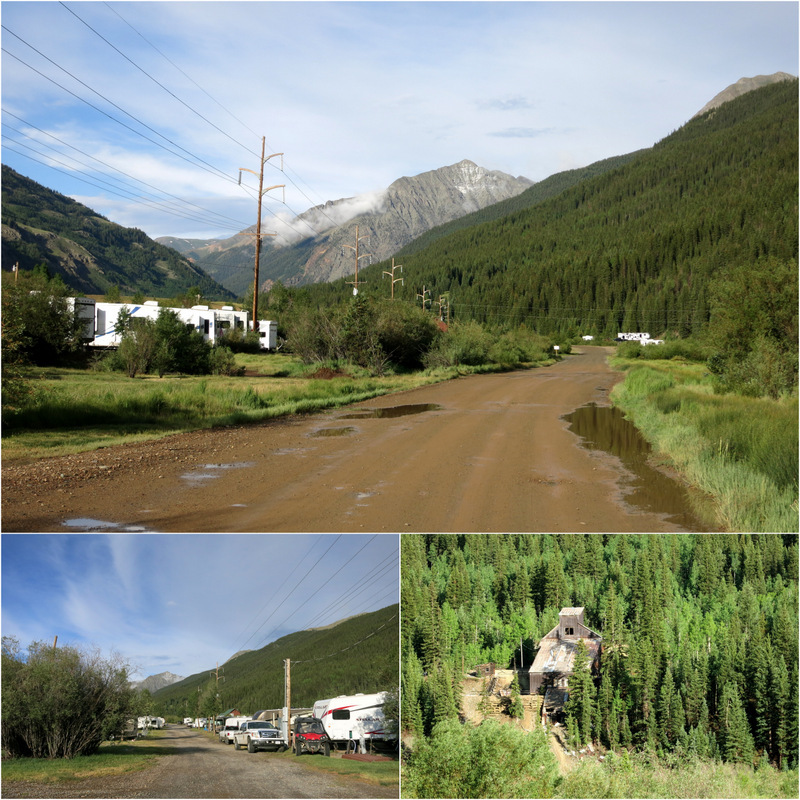 I was surprised that the Old Hundred Mine was not pictured…including the mine tour…. In the late 1950s we took a side road up to an abandoned mine on a mountain side and town. Parked my 87 dodge to take movie pictures when a heard of wild horse came roaring by led by a white stallion. we took pictures of them coming st us and leaving, yet the pictures never came out and there was no inturuption on the film which I belive to this day both me and my wife belive it was a ghost heard.